With a guard rail system in place on any residential or commercial roofing jobs, your crews are kept safe and they can keep their focus on the tasks at hand. Fall prevention is an important part in an industry, and in roofing accidents can happen in the blink of an eye. 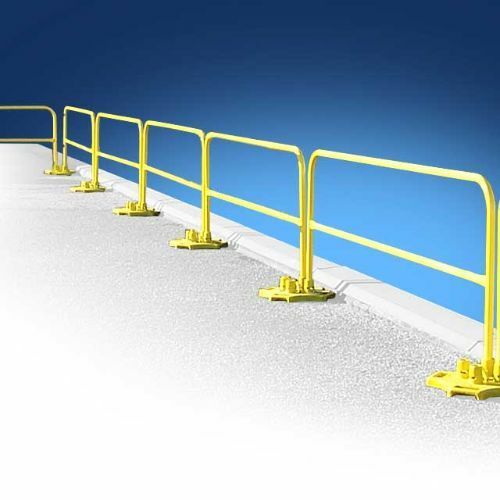 The Cleasby S00061 5 foot guard rail section is part of the full set up for a fall barrier system. With a 5 foot guard rail, you can easily accommodate smaller spaces and still provide adequate protection against falls injuries. The full barrier system is the ultimate in fall protection – Providing strength enough to hold against 200 pounds of weight when properly assembled. The S00061 5 foot section is part of the full system, which includes 8 and 10 foot guard rail sections, base plates and a transport cart. All of these items and more are available right here at Intech Equipment and Supply online! The Cleasby fall prevention barrier set up is unique in that it can be quickly assembled, and does not require any additional hardware. Detailed manufacturer directions are provided to ensure proper set up, and crews can be working safely in a matter of minutes. Further, Cleasby also has the handy transport cart to prevent against strain or injury when transporting the bases of the barrier system, allowing you to easily move about as the job progresses across the roof. The 5 foot rail section is affixed to the base plate during set up with provided pins. The base plate itself is reinforced so that damage doesn’t occur when transporting during the job or between jobs. OSHA specs are met for the base plates, which feature required steel brackets to hold toe boards. Browse roofing materials, safety equipment and more by Cleasby at Intech Equipment Online. One stop shopping for all of your residential or commercial roofing applications!